RICHMOND – Democrat Gov. 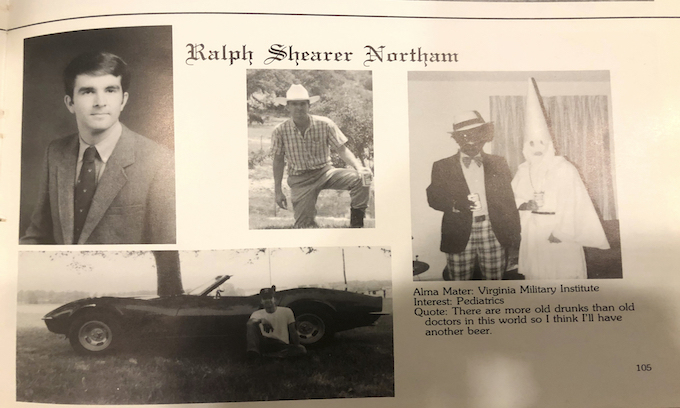 Ralph Northam apologized Friday after admitting he appeared in a racist photo in the 1984 Eastern Virginia Medical School yearbook depicting one person in blackface and another in a Ku Klux Klan outfit. The photo was met by calls for his resignation from Democrat presidential candidates and some of his own allies, as well as a scathing rebuke from the Virginia Legislative Black Caucus. Northam said in a statement Friday evening that he was one of the two people in the photo and that he is “deeply sorry.” The statement did not say whether Northam was the person wearing blackface or the person wearing a Klan outfit. Recent Story: Virginia Republicans defeat Democrat bill allowing abortions up until birth – Hear Gov. Northam’s comments on infanticide. – See video below. The news rocked Northam’s administration and he thus far has resisted calls for his resignation. “Well it’s never a good day for a politician when you’re confronted with the yearbook photo and the Washington, D.C., community in your state is trying to figure out whether you’re the one in blackface or the one under the Klan hood”. The right-wing blog Big League Politics first published the photo on Friday. Northam issued a video statement late Friday. In the video, he says he’s “committed” to serving out the remainder of his term, indicating he does not plan to resign. Sen. Bryce Reeves, R-Spotsylvania, issued a statement Friday afternoon saying he hoped the picture was “inaccurate,” but said that if it is true Northam should resign immediately. Taikein Cooper, who is black and is the chairman of the Prince Edward Democratic Committee, also called on Northam to resign. “You can’t champion racial reconciliation, during the 400 year anniversary of enslaved Americans being brought to Virginia, while being comfortable under the hood and/or behind a blackface,” Cooper posted on social media. In his apology, Northam said he would remain in office and heal the damage his past conduct had caused. Last month, Florida’s secretary of state, Michael Ertel, resigned after photos emerged of him posing as a Hurricane Katrina victim in blackface 14 years ago, the Tallahassee Democrat reported. Earlier Friday afternoon, Richmond Mayor Levar Stoney said in a statement: “This is deeply disappointing and offensive. I want to hear what Governor Northam has to say about this.” Stoney, an African-American, had recruited Northam to run for state Senate during his tenure as executive director of the state Democratic Party. As the evening unfolded, more calls came nationally on social media for Northam to resign, including from the NAACP and R&B star John Legend. Julian Castro, a 2020 Democratic presidential candidate and former secretary of the U.S. Department of Housing and Urban Development, called on Northam to resign. Northam is an Eastern Shore native who graduated from Virginia Military Institute in 1981 and attended Eastern Virginia Medical School in Norfolk. He represented Norfolk and the Eastern Shore in the state Senate from 2008 to 2014 before becoming lieutenant governor and then being elected governor in 2017. In a 2017 interview with the Times-Dispatch, Northam said he had just recently learned that his ancestors were slave owners. “My family’s complicated story is similar to Virginia’s complex history. We’re a progressive state, but we once had the largest number of slaves in the union,” Northam said. Early in his tenure as governor Northam had enjoyed signature achievements, signing off on Medicaid expansion and wooing half of Amazon’s eastern headquarters to Crystal City in Arlington County. But one tumultuous week sparked a sharp turn. The news of the photo surfaced two days after Northam made controversial remarks about late-term abortion that caused a storm in national conservative media and prompted Republicans to accuse him of supporting infanticide. As governor Northam has stressed inclusiveness. In his inaugural address he noted what he called Virginia’s “complex” history. “In a church on a hill 15 blocks from here, Virginia’s first elected governor helped launch the American Revolution when he cried, ‘Give me liberty, or give me death!’ ” Northam said. Race has played a key role in a number of Virginia’s statewide campaigns in the modern era. In 1989 L. Douglas Wilder became the nation’s first-elected African-American governor, an event seen as a milestone of reconciliation in a once-segregated South. Virginia’s current lieutenant governor, Justin Fairfax, is the second African-American to hold that role, after Wilder. In 2006, U.S. Sen. George Allen, a Republican, lost his re-election bid to Democrat Jim Webb after Allen referred to a Webb volunteer of Indian descent by a term considered an ethnic disparagement in some cultures. Virginia’s growing ethnic diversity has helped fuel the Democrats’ winning streak in a state where Republicans have not won a statewide contest since 2009. Then-Gov. Tim Kaine, now a U.S. senator, was the first governor outside of Illinois to endorse Barack Obama’s 2008 presidential campaign. That year Obama became the first Democrat in 44 years to capture Virginia’s electoral votes. In August 2017, following the deadly white nationalist rally in Charlottesville, Northam – then the Democratic nominee for governor – said in a statement that Confederate statues “should be taken down and moved into museums.” He has not pursued that policy as governor. Prior to his run for governor, Northam twice voted for Republican George W. Bush for president and at one point was nearly convinced by state Senate Republican leader Tommy Norment to flip to the GOP. During his 2017 run, however, Northam moved left to win easily in a Democratic primary against former Rep. Tom Perriello, D-5th. Typical Liberal Democrat immoral insanity, they think it is OK to kill a baby up until birth, BUT it is a mortal sin to them, to be insensitive toward anybody/anything that they choose to to con into supporting their Bull. This is a well-orchestrated trend. The trans-national ruling clique and its propaganda machine (the so-called “mainstream” media) are promoting corrupt, naive, un-American, or otherwise easily persuadable politicians who they later control. That is how they rule over us, today. We are talking no longer talking socialism we’re now talking communism.Cold hearted and totally lacking empathy Communists. Worse to me is that they are cheryy picking things from 30+ years ago to get offended at, forcing folks to ‘apologize’ for what they did AS A KID back then?? What’s next, taking your kindergarten year book and scouring that to see if there’s something MODERN senseless-abilities would find offensive to scream about? Scruffy: Democrats are a low life immoral bunch. According to the little ” Democrat Delegate”, Kathy Tran, who wrote and introduced the bill, stated her law “would allow” the outright murder of a viable human baby even after delivery. This slime bag ***** should be drawn and quartered and fed to the hogs. Governor Northam defended this barbaric and inhumane procedure. He claims to be a pediatric surgeon. He is an animal that should be put down like a rabid dog. Clearly, according to Northam’s own words, “the fetus would be made comfortable” until it was decided what to do with it. Since there apparently is no time limit on how long the baby should be “made comfortable”, then I presume that years down road, that person could be aborted (killed). There are many who have been “made comfortable” long enough. They now need to be aborted from this world. Tran and Northam should be among the first ones to go. We apparently have many people who think uttering a racial slur is much worse than killing a baby. To the rabid left, of course uttering a racist slur, is more offensive than killing babies.. THEY SEE NOTHING WRONG with the latter.. Reminder: The people to “guilt” over racism are the DEMOCRATS. Slavery, segregation, the KKK, Jim Crow, lynchings, poll taxes, literacy tests, governors blocking school doors, barking dogs and water cannons … are all courtesy of the DEMOCRATS. As all those old DEMOCRAT institutions faded, starting in the 1960’s, DEMOCRATS found a new way to enslave minorities — lifelong dependence on Big Government. Now minorities are treated as VOTING LIVESTOCK on the Big Govt DEMOCRAT Dependency Plantation, especially inner cities with miserable, corrupt 100% DEMOCRAT municipal management, horrible schools, low expectations, and cultivation of the victim-hood mentality that locks otherwise fine Americans into lifelong misery, fatherless homes, and poverty. Now the Party of the Klan is also the Party of Infanticide. Way to go, Democrats! That’s quite a legacy, old and new. I agree with you 100%. If blacks will wake up and study the evidence before them, they’d discover that the Dems are the people who kept their ancestors on the plantation, who blocked their children out of certain schools, who water blasted peaceful black protesters, etc. Abraham Lincoln, who freed the blacks, was a Republican. Unfortunately though, many blacks won’t face these facts because they’d rather stay on the liberal “plantation” with the hand outs, free phones and their claims of victimhood. And cry racism at anyone, who DOES try to educate them to these facts. Normally I would cut young people slack for being foolish but 1984? Was this guy living under a rock? That would have been Ignorant and foolish fifteen years earlier. By 1984 everyone should have had time to think and rethink their prejudices. None of us are too young or too old to pick up the ID that our peers place upon us.Most of us conform to the character that feeds our ego. That’s not who we are, it’s how we think we are identified for that time (NOT FOREVER ) When can we accept and utilize the talents of others, no matter how they identify and stop the HATE politics. I’m not in Virginia and not a Democrat but Gov. Northam the last few days has impressed me. Most of all on the abortion issue I see that he is one of a very few men that might be qualified to comment on abortion Yet he commented (my long held uponion) that MEN (who dominate Virginia’s legislature) have no place in deciding a woman’s fate in such things as abortion. Abortion is a HUMAN issue, not just a “women’s issue” because both genders contribute to the problem of unintended pregnancies and thus it will take everyone to help deal with the situation. The babies being aborted are both boys and girls so, again, males must have a voice in the discussion. Abortion is NEVER the solution to an unintended pregnancy. If, indeed, the new mother is unable to raise the child; there is at least one couple near by who is unable to give birth themselves but would love the honor of providing loving care for the baby, now and forever. If the birth-mother wants to visit the child, that can be arranged. If the birth-mother wants to remain anonymous, that too can be arranged. Adoption agencies exist to make the plans of the birth-mother a reality…and to help infertile couples have children. This is a perfectly beautiful option for many people. MAx. Do we know the CONTEXT of him appearing in that photo? Was he going to a costume party? IF so, how then would what he did in the 80s, be foolish? IMMEDIATE GRATIFICATION Liberal Democrats always ignore or destroy those who are unable to vote for or against them who might get in the way of those immediate social or sexual gratifications. Hence it is OK to abort the “get in the way” of their immediate gratification lifestyle innocent unborn about to exit the birth canal, where they only see god in the mirror, who they indiscriminately self-empower with the selection of life or death over innocent others, just like they empower their politicians with the power of who gets to keep their personal property (Earned expended Life-force) or not, now elevated to the very lives of innocent babies who they perceive as so much social redistributable or destroyable personal property of the state. On the other hand they ignore the pasts of those they should destroy, but can become Marxist/socialist defined party useful idiots when it comes to party elections. Their socially conquered educational and media propaganda arms redefine American history to suit their needs like they redefine their corrupted socially tainted candidates. Thus 1865 hooded KKK night-rider enforcers who were the terrorist arm of the Southern DEMOCRAT party are media morphed into modern day White Supremacists of a Republican Conservative stripe. Just how radically and extremely outwardly corrupt can they get before THE PEOPLE wake up to who the real American enemy is? Watch and see how they opportunistically feed upon themselves in the primaries, and see how they will later feed upon YOU, THE PEOPLE. Racism to them DOES have a place in America, but only when it works to their Party and Personal advantage. Democrats are morally bankrupt, there is nothing but diseased rot between their ears. Lets see know. It is OK to KILL a baby even after it has been born, but we are having a fit over a couple of who gives a damn photos. I think some people needs to take a hard look at their own believes. Those who believes this is ok, then should be ok with considering themselves murders. These people should be considered the scum of the earth and I certainly do not want them making any decisions for me. They are beyond liberals, they are murders. Its not just “ok to kill them’ but its worthy of being CELEBRATED, in the libtard rotten minds.. This picture is misinterpreted by the media and also those who want to stir up sh%t. Anyone SHOULD be able to look at this picture and see peace between 2 factions that were SUPPOSED to be archrivals. They are getting along well. They are not at each others’ throats trying to kill one another! Don’t you see the peace and tolerance here?? Demorats can fabricate a lie from the truth and sell it as being true! Just like the video of the Catholic boys (with a fake news headline) who did nothing wrong. Twist it into a lie and sell it as truth! They are using the psychological power of suggestion to try to control minds. Can anyone see that? Isn’t it a wonderful world for democrats…You can pass laws to murder born babies and be a racist…and in this brave new world of double standards democrat’s get to keep their jobs…But to bad so sad for Roseann…right? It’s pretty sad when the governor of an American state stands up and says if a baby is born alive in SPITE of trying to abort it, it will be cared for while the doctors and parents decide whether it should live or not, after it is born ALIVE, which is the commonly accepted definition of a LIVE HUMAN BABY. And there is UTTER silence and ZERO outrage from the ENTIRE LOONY LEFT–including the Leftist propaganda shills in the media–bout it. And then they discover a picture of him and somebody else from YEARS ago in Halloween costumes–one in blackface and another in a Klan costume–and the ENTIRE Loony Left–media INCLUDED–goes nuts. Fake outrage all over the place, demands for his head, politically speaking, and, maybe, before it’s all over–LITERALLY. Just MORE proof that Leftist ideology is UTTERLY devoid of morality OR standards of common human decency. To me if its born ALIVE, and they STILL Discuss aborting it AFTER THE FACT< every bloody one of them should be up on charges of MURDER.. PREMEDITATED murder. my govenor in nys, andrew cuomo, has just signed a law to permit ANYONE to kill a baby, even after it has been born. You do not have to be a doctor to preform this “service”. This was met bay a cheering standing ovation in the nys legislature. Let us review, blackface, kkk, killing baby’s anytime by anyone, all these thing are followed and endorsed by all democrats/socialist/communist. Our country (and of course my state of ny) has really been turned upside down by these millionaire so called “public servants”. andrew has also named the new tappan zee bridge over the hudson river, in westchester county. without any debate in the legislature after his father mario the pius. This idiot govenor from virginia want to tear down every confederate hero statue down to place them in some musum somewhere. Besides believing that virginia will tear down all confederate statues, does anyone believe the statue remains will be placed in a museum besides the local land fill ?. Sorry for your situation, but I have to ask a question about living in nys. Am I the only one who thinks that if the government is willing to kill babies, that they feel different about the aged, handicapped or mentally challenged? Where does the madness end or does it? That’s what the obama care death panels are for! Cuomo, another whack that should have been recalled right after he was elected! These people who can advocate the killing of the unborn, or ‘born,’ have at the best NO conscience, and at the worst, though they have a ‘soul,’ believe NOT there is any consequence! Those who elect these ‘evil’ people will also not go unpunished…. YOU ALL THINK THEY MIGHT JUST BE TRYING TO ABORT OUR HERO ANCESTORS OR EVEN OUR HISTORY? Pretty much my thinking, especially when almost all the talking heads were salivating to get anyone and everyone steamed up over this ‘racist’ photo. Alveda King was on the Laura Ingraham program, and though me dawlin’ Laura kept trying to get Alveda to come unglued about that photo, she failed. Ms. King was correctly more upset about America accepting, or ignoring, “INFANTICIDE!” There are more than a few RACISTS walking our esteemed halls of congress, but the ‘black face,’ or ‘KKK hood’ has not yet appeared. My issue is with our out-of-control-PC-country. To be more concerned with some racist or racism over the KILLING of an ALIVE infant/baby is one of the most egregious misplacement of ‘priorities’ that the human race might have. To allow someone, having proven they have **NO conscience** by advocating these types of abortions, to have ANY position in America’s government, County, City, State, Federal, is at the least letting barbarians enter at the gates! America is already paying for having destroyed the entire populations of several countries, 62 MILLION and counting. There will be a FINAL price, because, as they say, The Piper Will Be Paid! Democrats do not want to come out against any form of restriction on abortion, even if it is to the point of infanticide. But an old photograph that implicates Northam as a racist is all they needed to call for his resignation without betraying their party’s stance on the killing of babies, even if, in their heart, they are opposed to it. How convenient! Now if they could just find a similar picture of Cuomo. Might help him with Dem Party to put on black mask & take selfie with masked anti-fa group. Be sure to hold a bowl full of butchered baby parts in pic though, Governor, so everyone will know which one is you. The Gov apparently forgot to “evolve” & notice it is not ok to be associated with an out-of-date terror group like kkk, the new in-crowd domestic terror groups Dems hang out with are anti-fa & black lives matter. The article states how Virginians used to “sell men, women, and children for money.” The Democrats haven’t changed a bit! They are now killing innocent babies and baby parts for money.” They pretend to be outraged over the greed of the rich, yet they are the ones found guilty of greed. They know no bounds. They choose the most defenseless of all, and brutally butcher them, all with the consent of the “mother”. That is murder for hire, pure and simple! Will this infanticide finally open the eyes of these “sheep” who vote Democrat every chance they get? It is the party of corruption, crime, greed, death, and all that comes from the pit of hell. Mocking a Black person with a blackface outfit is bad. OK, I get that. Threatening a Black person with a KKK outfit is bad. OK, I get that. But killing a Black person (through abortion) then selling the body parts is “OK”? No. I don’t get that. A disproportionately large percentage of the children aborted by Planned Parenthood are Black. The founder of PP was Margaret Sanger, an outspoken racist who ‘inspired’ Hitler to slaughter Jews in the Holocaust. The Democrat party is supporting PP in its efforts of slaughter innocent babies of all races, but especially Black ones. Yet in defiance of any shred of logic, Democrats claim they are the political saviors of the Black community. It does, however, make perfect sense that a Democrat governor would mock and threaten Black people years ago and also be working today to kill as many Blacks as possible through abortion. OK. Now I get it. Let’s give Northam credit for telling the truth about one matter — that he would bring together black and white Virginians, liberal and conservative Virginians, rich and poor Virginians, the old and the young, and Virginia’s Democrats and Republicans. And he did, he truthfully fulfilled his campaign promise. Because I have never seen Virginians so united on an issue — they all want him to resign! Now!! Then perhaps those dumbos should have NOT VOTED this cretin, into office in the first place. Now the headline of the article makes a very valid point, why not the same reaction over the infanticide comments? 1.). He was so incoherent, it was tough to figure out what he was saying. I too presume it was for infanticide, but wow, was he inarticulate. Of course, that could have been deliberate — to obfuscate that which is reprehensible. 2.). Actually, looking at many Virginia websites, and reading news stories from Virginia, and even talking with friends and colleagues in Virginia — many from the liberal side of the spectrum were indeed outraged! We would have seen more from liberals expressing their anger, but Northam’s “more obvious” (i.e., with photographic evidence) racism trumped the story of shock at incoherent infanticide. 3.). If you read enough of the Virginia websites, you see many (including Democrats) suggesting that the Virginia Democrats and/or the DNC were so embarrassed at Northam’s handling of the abortion issue — during an election year — that they leaked the photo to a conservative site to get Northam out of the way. He was going to be a drag in this fall’s elections, he needed to go now. If the Republicans had this photo, you know it would have appeared during the gubernatorial election, or last November’s election. But the hypothesis is the Democrats had it as insurance in case Northam had to go, but they dare not post it, so it was passed on to a conservative site. The is all speculation. Liberals are the standard bearers of double standards. Their motto says do what I say, not as I do. Therefore they have no moral problem with twisting the truth to fit their narrative. So now, in America, ot is OK to euthanize living babies, but a crime to kill a dog. How twisted can they get? Liberals are all for killing innocent babies, but they don’t like seeing photos showing a liberal dressed in black face or a KKK robe. Why? Because they see themselves in those photos and know they have been exposed. Following Alinsky’s Rules for Radicals, they will be blaming conservatives soon as cover for their complicity.